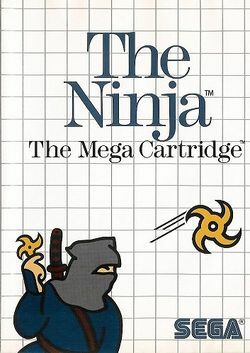 The Ninja (忍者, The Ninja? ), a port of the arcade game Sega Ninja, was released in 1986 in Japan and 1987 elsewhere by Sega. It is a typical run and gun game, such as Commando, where the player has to shoot enemies and defeat a boss at the end of each level. Enemies include samurai, enemy ninja and wolves. The player's normal weapons are an unlimited supply of throwing knives, but power-ups to shuriken are available. In addition, the player can also turn to smoke for a short period of time. While most of the stages are vertically scrolling, a few of the levels add some variety – including a level where the player must scale a wall. Among the changes from the arcade version is the female protagonist being changed to a male ninja called Kazamaru. Other changes include the rearranging of stages from the original Japanese release in western releases of the game, as well as a scroll system, which requires that five green scrolls must be collected to get to final level of the game, as all of them are needed to open a secret passage to the final level. This page was last edited on 13 July 2009, at 16:51.